The 3rd Symposium against Discrimination brought the Confederation of Public Workers’ Union (KESK), Education and Science Workers’ Union (Egitim-Sen) and Cyprus Turkish Teachers’ Union (KTOS) together. Kaos GL Association’s Symposium Against Discrimination took place last weekend in Ankara. Held at Tum Bel-Sen (Trade Union for All Workers of Municipalities and Local Administration Services) Conference Hall, the symposium spread the message that “LGBTI rights are trade union rights”. The session on union experiences in Turkey and Northern Cyprus was moderated by Turkan Karagoz from Izmir Egitim-Sen Branch No. 2 LGBTI Commission. Below are the highlights from the session’s speakers. Unionists from eight countries and representatives from LGBTI organizations met in Ankara this weekend for the Kaos GL symposium. The 3rd Symposium against Discrimination was opened by Ulrike Lunacek, co-president of the European Parliament’s Intergroup on LGBTI rights, via a video message. Lunacek emphasized that the European Union’s chapters 23 and 24 should be opened in accession negotiations with Turkey, which focus on judiciary and fundamental rights, and justice, freedom and security. Stating that laws are not enough to tackle discrimination, Lunacek stressed that LGBTI people are subjected to self-censorship in the workplace. “How come a police officer can be fired based on his sexual orientation in 2014 in Turkey?” asked Lunacek, pointing at the importance of heterosexual allies in the fight for LGBTI equality. Below are some highlights from the sessions of the symposium. 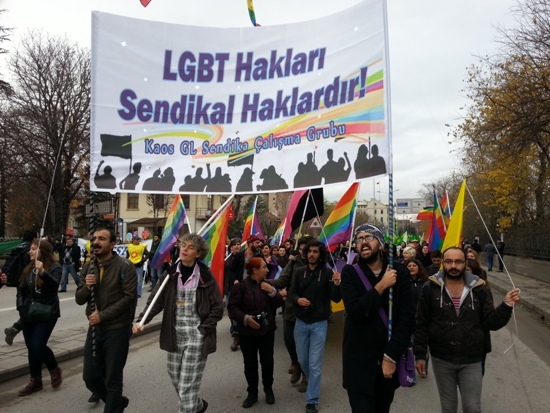 The Education and Science Workers’ Union (Eğitim-Sen) and the People’s Democratic Party’s (HDP) panel of gays and lesbians in southeastern city of Batman led to big reactions from the people of Batman. Eğitim-Sen’s panel entitled “Students Living with Sexual Orientation and Gender Identity,” held last weekend at the Batman Municipality Conference Hall drew the reactions of Batman locals. Activists from the gay movement and the representatives of Batman Eğitim-Sen Branch attended the panel. Remzi Altunpolat- LGBT (lesbian, gay, bisexual, trans, and intersex) activist, Kaos GL member, and HDP member- and psychological consultant Berna Savcı attended Batman’s first ever panel as speakers. What’s the goal of such activities in Kurdistan?